The Car Connectivity Consortium, which counts Apple among its charter members, on Wednesday announced the publication of new "digital key" standard that allows drivers to actuate vehicle systems like door locks and the engine via an NFC-enabled smartphone. With its technology, aptly dubbed the Digital Key Release 1.0 specification, the CCC aims to bring automotive manufacturers and mobile device makers together to create an interoperable digital key standard. The system operates in much the same way as first-party digital keys currently available from a handful of vehicle OEMs. Users with authenticated smart devices are able to lock, unlock, start the engine of and share access to a specific car. Unlike some remote control solutions that leverage Wi-Fi or Bluetooth communications, however, Release 1.0 appears intrinsically tied to short-range technology like NFC. Relying on existing Trusted Service Manager (TSM) infrastructure, Release 1.0 allows carmakers to securely transfer digital key information to a smart device like a smartphone, perfect for car-sharing or fleet deployments. Specialized hardware like near-field communications chips and internal secure elements provide a high level of user protection. 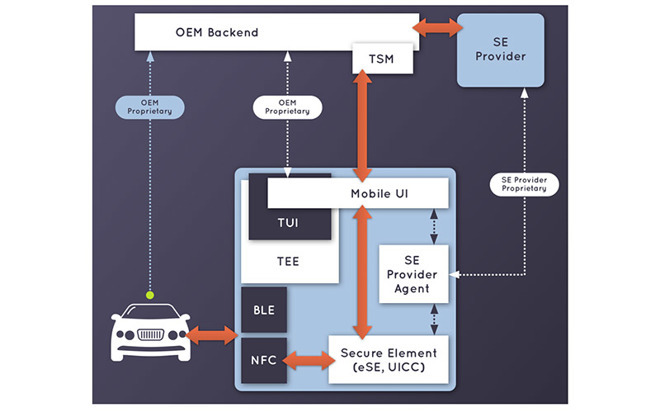 According to a white paper outlining the technology's architecture, Release 1.0 looks to create standardized interfaces between a car, a smart device's NFC and Bluetooth Low Energy stack, secure element, first-party app, TSM, OEM backend and SE provider. OEMs are responsible for proprietary interfaces between their respective backends and the car. As noted by the group, which focuses on developing mobile device-to-vehicle connectivity solutions, a number of carmakers already field proprietary digital key solutions, though the market is fragmented. A single unifying standard would not only enhance the customer experience, but provide manufacturers access to the latest security protocols and technological advancements, the CCC argues. CCC charter member Audi is already using digital key technology in its vehicles, while Volkswagen, another charter member, said it plans to integrate the technology soon. Alongside Audi and Volkswagen, Apple, BMW, General Motors, Hyundai, LG Electronics, Panasonic and Samsung are listed charter members of the organization, while core members include ALPS, Continental Automotive, DENSO, Gemalto, NXP and Qualcomm. The CCC says it is already working on a Digital Key Release 2.0 that should be completed by the first quarter of 2019. The second-generation technology will provide a standardized authentication protocol between the vehicle and a paired smart device, and will be fully with interoperability between difference smartphones and cars.